Well, Delane and I finally made some of the arrangements for our trip to Cairns/Port Douglas. We are flying into Cairns and then driving North about 50K to Port Douglas. It's supposed to be an amazing little town with nice beaches. We'll stay at the Sheraton Mirage for 3 nights. Then we'll hope on a boat for a trip to the Outer Great Barrier Reef. We'll spend the day snorkling and relaxing, spend the night on the boat, then more relaxing and snorkling before returning to the mainland. Haven't worked out the last few days yet, but we are trying to find a nice place in the Daintree rainforest to stay. Well Jim filled you in on the weekend mostly. After footy on Saturday night we had tickets to the opera house for Sunday afternoon. We had a leisurely morning and walked through "The Rocks" an old cool area of town and stopped at a weekend flea type market. Very cool stuff! Here's where the spoiled part comes in. We went over to the Opera House had lunch at the Opera Bar restaurant which was GREAT! Then it was off to the 18th annual Australian music festival in the concert hall venue. They have several venues, Concert Hall, Drama and Opera Theaters, Playhouse, etc. So, we headed in and needless to say it beautiful! VERY VERY cool venue. We saw two choral groups and then three different orchestra ensembles. One string and the other two brass and woodwinds. The music was amazing and beautiful. I just found myself sitting there overwhelmed at how lucky and blessed I was! Just to be sitting there, in that place hearing that music! I couldn't believe little old me was sitting there in the Sydney Opera house! I found myself wanting very badly to be sharing it with all of you, all of you that I care about and love! During the intermission we walked around a bit and the entire front of the house is glass and all you see is the harbor bridge and water! The architecture and detail is just AMAZING, everything went together and there was not a single wasted space. Ok, get ready to laugh but the restrooms in this place are UNBELIEVABLE! Brooke, April, and Tamara will vouch for me on this. I know this will guarantee me a few response comments :) Darryl you can keep yours to yourself :) The stall doors were completely wood and curved vertically as were the walls. The sinks were the same but.... with no drain! It was like one big white porcelain table with a small 1 inch space between the sink and wall and all the water just flowed back behind there! Anyway it was an amazing experience! Thanks to all of you for reading, checking in, commenting, emailing, etc. We are blessed and spoiled most when it comes to all of you, our friends and family! It really is so nice to hear from you. We miss you dearly and have you in our thoughts! Lots of fun this weekend! Friday night had us heading to a local pub for a few pints and some food and chips. We wondered down to a very popular Irish pub and split a pint and watched a bit of footy. End of the week made Jim sleepy and we were home and relaxing by 10. Saturday was a blast! We had a nice leisurely breakfast then walked over the bridge to the grocery. Hopped the bus back with groceries and changed up for a run. The temp was warming up nicely and I broke a nice sweat. I finished my run at Observatory Hill (the highest point in Sydney overlooking the harbour and about 100 yards from my place). Delane was up on the hill doing a nice yoga session. Beautiful view, nice weather, yoga....perfect. We zipped home to shower and head to Sydney Olympic Park. We had footy (rugby) tickets for a match between the Sydney Swans and the Melbourne Magpies at Telstra stadium. The stadium is part of Olympic Park. We spent a couple hours exploring the park then hit the beer tent for some food and drink before the game. We had great seats and watched our first Aussie Rules footy game. It was hyped all week as a huge match and we were expecting a good game and a rowdy crowd! It was much more laid back than we both expected....I guess I imagined a bunch of unruly drunks throwing stuff! Anyhow, the Aussie rules footy is a bunch different than Rugby league rules. In the case of this game, much less exciting. The Swans got CREAMED and played so poorly it made the game a bit less exciting. But the experience is not one to be missed. Really a great time. Well, Delane and I are sad to see Brooke, April, amnd Tamara departing today. The weather finally returned to normal yesterday and the girls (Delane included) wore themselves out enjoying the beautiful day! The went to Hyde Park and enjoyed lunch in a nice cafe, back over to Darling Harbour for some clear weather pictures, then to Circular Quay and the Royal Gardens for some last minute pictures. The 5 of us went out for a nice early-bird dinner at a lovely place right down from my apartment. Then the girls had to rush off to make an 8:00 PM show at the Opera House! Travel safe, ladies! Thank you for visiting. Delane and I will miss ya'll! Ok, been a few weeks since I told some running lies, so back to it! There is a group run Tuesday in the Park right up the street from my office called "Pain in the Domain" . It starts at 12:50 and is a 6K run over a variety of terrain focused on 13 "sprints" of different distances mixed with recovery. The sprints range from 50 meters up a steep hill to 700M all out on flat paths. It is not actually an "organized" event, but even on a very rainy day yesterday about 150 people front up. Some weeks there are 250+. The run has been occurring for 12+ years, so a veteran runner will step forward and take the lead for group one. Normally there are 5 groups and the only difference is the pace. Group one targets finishing in about 27 minutes and the other groups depart one minute after the previous with a pace maybe 30-45 seconds slower for the entire 6K. So, 6K, 27 minutes, what's the big deal? Man, is it tough! The sprints are 80-100% depending on the segment. Here is what makes me laugh....the leader gets everyone ready for a sprint....here is the general communication "Ah rig, gather up. From the new henry, down the gullia, to the second gum full out". So the interpetation is "Ok, get ready. We'll go 100% starting at the Statue of Henry, down the hill, then up the hill to the second gum tree." Too funny. The running language is probably more different than anything else! Wow....what a day! We left the apartment today around 10:40 to catch the 11:00 AM ferry to the zoo. The zoo is across the harbour and the best way to get there is to catch a 15 minute ferry across the harbour. Weather held out for an amazing tour on the trip over. When we got off the ferry, you had a choice of a bus or cable-car ride up the hill to the zoo main entrance. Might I highly recommend the cable car ride! Straight up the hill going over the entire zoo. Very nice! The zoo itself was amazing! By far the best I've ever seen. First, it's huge and has to be the best located zoo in the world....it's right on a point on a hill overlooking the harbour. The environment is very relaxing. Not animals packed in cages, but rather a very open and spacious environment. They had animals from all over the world, but the really neat stuff was the Australian animals. Kangaroos, Wallabies, Emu, and tons of others. Will post some pics later. It was nice going with 3 people in the animal business. I felt like I had the personal inside info on all things animals! Delane and I caught the ferry back after being there almost 5 hours and the rest of the girls wanted 45 more minutes and were gonna catch a later boat. All and all a great day when given that it's still raining periodically. We are definitely getting our money worth out of our umbrellas! After having only 30 minutes to get off a flight from Charlotte to San Fran and on the plane to Sydney, Brooke and crew arrived yesterday morning minus 1 bag of luggage. Sharing some clothes, the gang wandered around town a bit and went to see the Dali Lama speak in a park. I joined them for a few minutes but then had to zip back to work. 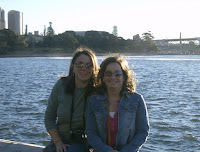 The girls hit the aquarium in the afternoon and then we met back at the apartment for some happy hour pints and then some grub at an Italian place in "The Rocks". The only bummer has been the rain.....still not as nice as we'd like. Friday rained on and off a good bit and today has been better up still rainy at times. We spent a good deal of time roaming Darling Harbour. We went to Paddy's Market and the girls bought all kind of goodies. Paddy's Market is like a HUGE farmers market and flea market wrapped into one. Here is one soht of all of us and I also posted a link under pictures to the right with some other new photos. Hoping the weather turns nicer tomorrow so we can all go to the zoo! Rugby League, Aussie Rules, Rugby Union, State of Origin...Um... WHAT???? Well, last night Jim and I had our first Australian football experience. You all know how we are about our football so we figured we'd "give it a go" as they say around here. We went out the burbs and met a friend of Jim's from work. He is a local and invited us out to his "local" (ie, local pub) to watch the State of Origin Game between New South Whales and Queensland. Evidently this is somewhat of an Allstar game where all the best rugby players play with their home state team. They play three of these games a year and New South Whales has already lost the first two, ie. the series :( It was fun to watch and we learned a lot watching with a local and figuring out their rules and how it all works. We hear you all are getting a little rain at home recently which is GREAT. I know you need it! Weather is great here and we are anxiously awaiting the arrival of Brooke, April, and Tamara! We did just hear that their flight from Charlotte to San Francisco is delayed a couple hours so we are hoping they can hussle and make the connection from San Fran to here. Well, enough about us. Please email us and let us know how you all are and what' s going on back home. We miss you all lots. Take care!!!!! Well, We had a grand time on Monday (a holiday here) hanging out at the Jazz Festival. The weather was excellent. We sat on the lawn and listened to a US Marine Jazz band for a bit and had some Barbeque. They had 5 different stages going, so after a bit we moved on to a smaller stage. This picture is the result of the visit to this smaller stage......the best "Caption" posted in the blog will get a treat from Australia when Delane returns! the challenge is out! PS: More pictures posted to the right. PPS: My sister is arriving Friday....wish her and friends safe travels. Sunday started to get much nicer in Sydney. The clouds cleared and this blue thing called the sky was seen for the first time in days! :). Although it did drizzle a bit, it didn't stop Delane and I from taking a lovely walk along the "foreshore".....all the paths and parks along the water. There are two parks, the Royal Gardens and The Domain, that stretch for a long ways along the harbour starting near the Opera house. We started near the Opera House and walked 3-4k along the harbour. Stopped for a coffee and muffin once we reach "The Domain". There are these guys that stand on boxes in the park right by the cafe. They are the "Domain Philosophers" and stand there for hours talking about whatever, politics, religion, the environment. Pretty funny. We had dinner out at Jackson's on George (local upscale pub) with a guy in town from Atlanta doing some work with me. Decent grub, good beer (and wine for Delane). A great end to an awesome days. Did this weather come with D? Sydney and the surrounding area has had about the worst weather they've seen in many years over the past 2-3 days! Poor Delane has been stuck not getting to explore much because of terrible storms. They've had flooding and several ships wash up on shore from the storms. They have a 3 day Jazz festival right now the street at Darling Harour today through Monday (Monday is a public holiday here). We are hoping the weather lets up a bit so we can enjoy some music. It's been awesome having Delane here. We've been out having a Toohey's at the local pub several nights and enjoying the time together. Couldn't talk her into EMU Pizza! Delane and I got to share out first meal together in Sydney last night! We went to the "Australian Hotel" which is really just a typical Sydney Pub (I don't think you can actually stay there!). As much as I tried, I couldn't talk her into Barbeque Emu pizza! I bet Darryl Martin would have been all over it! While I was out yesterday, I saw a street sign for a race today. It turns out it was just couple kilometers from home, so I got up today a jogged over for my first Aussie race. It was the MS Run 8K. They have a 9K walk event that started at 10 AM as well. The site described the course as "hilly".....an understatement! Very tough course with 3 places where you had to run up stairs! Many similarities to Atlanta races and a few differences. Race T-Shirts are NOT to norm for races. Seems only big events (marathon, half) has shirts printed. The race course was not targeted for smooth and safe as often is the case at home. We were popping up curbs, running up stairs, zipping through parks with dirt trails, the works. Of course there was the same type runners there.....social athletes, team racers, and a reasonable number of decent runners that seemed to know each other. The running community here is very strong. I finished 30th (maybe 800 people). My time was nothing to celebrate....31:30 which translates to about a 39 minute 10K. I was happy enough given the very slow course. My legs have also been pretty dead from running and then LOTS of walking around town exploring. You know how the little things sometimes cause the biggest smiles? I made my way to a "real" grocery store today to stock up on some food and apartment items. There are 3 stores within close walking distance but all are rather small and very expensive. There are several larger more reasonably priced groceries 3K or so away. So I got up this morning, took a scenic stroll over the harbor bridge and went to a big grocery store. I stocked up on a bunch of stuff and took the bus back over the bridge. All and all a smooth experience and the prices were MUCH more reasonable (not compared to Atlanta, but compared to places I've been up until now...). The rest of my Saturday was great. Weather continues to be awesome....right at 70 today but I hear it will be cooling down a bit later this week. After the morning grocery excursion, I ran over the Centennial Park and the Fox Entertainment District. The Aussie Stadium (Rugby) and Sydney Cricket fields are over there as well. Nice place....a HUGE park with people strolling, playing cricket in the fields, and horseback riding. Ran back via Paddy's Market and bought a pound of shrimp and some veges for dinner. My first meal cooked here (other than one pasta night). Yummy.